Till now Microsoft and Sony have kept a tight lid regarding the architectural details of their upcoming consoles. At Hot Chip 2013, Microsoft in an conference has unveiled their 5 Billion transistor boasting Xbox One architecture. Images are courtesy of TechHive! 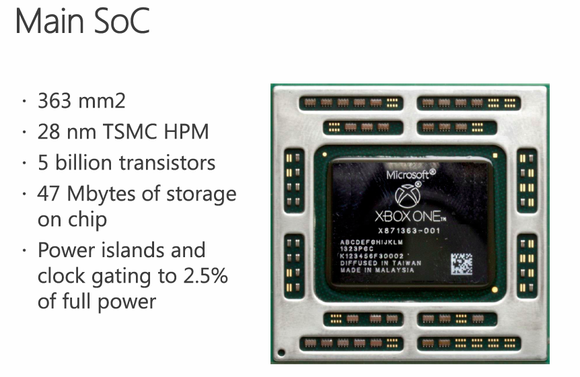 The Xbox One architecture detailed consists of the main SOC (System-On-Chip) that is manufactured on the 28nm TSMC HPM process design. 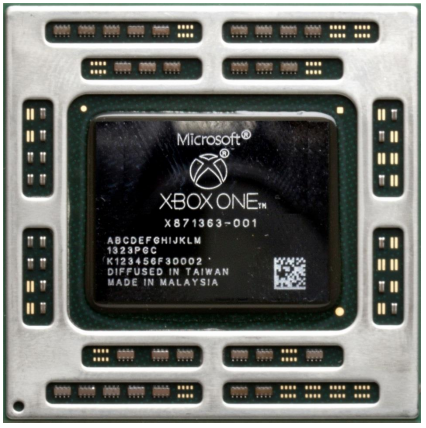 The Xbox One’s accelerated processing unit covers a die size of 363mm2 which is huge considering AMD’s flagship Tahiti chip comes with a die size of 389mm2. Under the hood lies a massive five Billion coupled with 47 MB of onboard storage and being power gated down to 2.5%. 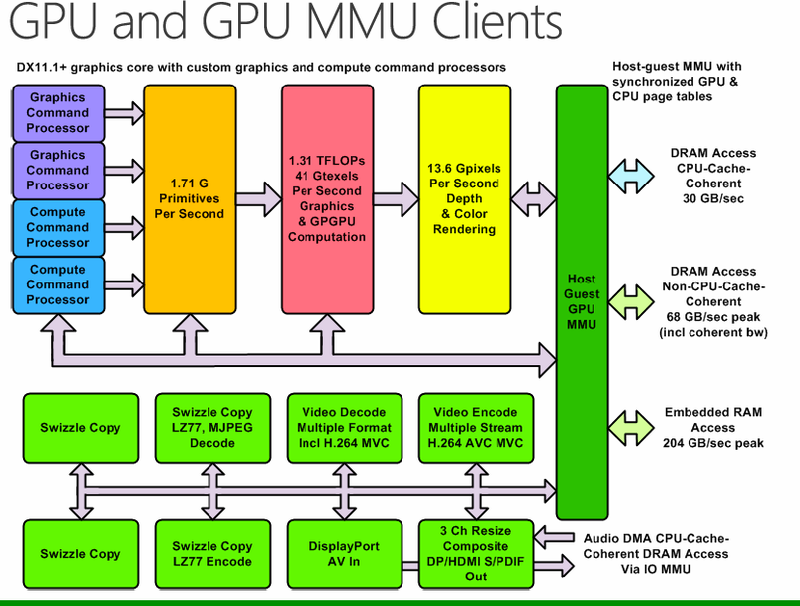 Audio offload processor custom designed by Microsoft – 1 CPU core worth of processing. 68 GB/sec peak bandwidth to off-chip 8GB DDR3 memory. 204 GB/s peak bandwidth to 32MB of on-die storage. The Xbox One architecture is designed to allow users to play games with adequate performance without making compromises elsewhere. With 8 Jaguar cores and a GCN enabled graphics architecture, the Xbox One features a compute performance of 1.31 TFlops which is lower than its rival PlayStation 4 boasting 1.84 TFlops of Compute performance. The reason for such a big performance hit is the GPU on the Xbox One. While Xbox One features the same architecture as PlayStation 4, it however sticks with a lower CU count of that amount to 768 SPs or stream processors compared to 1152 on the PlayStation 4. Furthermore, the Xbox One is backed by 8 GB DDR3 memory while PlayStation 4 is boosted by its 8 GB GDDR5 memory which offers faster texture and graphics rendering. While Microsoft have released the details regarding their Xbox One architecture, it could be easily noted that Sony’s SOC would be larger in terms of size and performance. 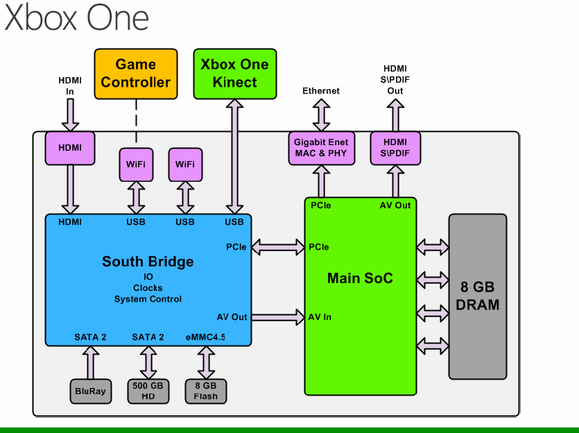 Coming back to the Xbox One architecture, the SOC is directly linked to 8 GB DRAM and offers HDMI and Gigabit Ethernet through onboard controllers. The SOC is also linked to the PCH Southbridge that offers external ports such as two WiFi, HDMI IN, USB (Kinect), two SATA 2 ports (Blu Ray / 500 GB HDD) and 8 GB NAND Flash eMMC 4.5. For audio, the chip is backed by Microsoft’s own design that has two 128bit SIMD FP vector cores, floating point performance 15.4 GFLOPS and special hardware engine performance equivalent to 18G OPS. The graphics part is the most interesting, we mentioned above the architecture but going into details we found out that Xbox One GPU architecture offers full DirectX 11.1 support and featuring graphics and general purpose GPU performance of 1.31 TFlops which is an update over the previously rumored 1.23 TFlops. This comes as an update with the 50 MHz clock boost we heard a few weeks back. The GPU churns out 1.71 G Primitives/ second, 41 GTexels/s and the GPU is paired with three sets of ram – DRAM access (CPU Cache Coherent) and 68 GB/s with non-CPU cache coherent DRAM access. The GPU would also have access to high performance eSRAM with a peak bandwidth of 204 GB/s. This confirms the existence of a coherent or should we say uniform memory architecture on the Xbox One which would be similar to the unified memory approach by Sony on their PlayStation 4 console as reported previously. Well this is it for now but we will sure to keep you updated regarding any new details for the PlayStation 4 and Xbox One.